Microlaena can spread by stolons, rhizomes and tillers arising from corms beneath the surface. The rhizomes and corms protect the plant from heavy grazing. The stolons can facilitate rapid spread in good seasons. Seed production, viability and germination is not competitive with annual species, so it’s important that existing plants are protected to maintain composition. Tiller growth of Microlaena arises from corm-like structures which are located approximately 20 mm below the ground surface. In addition to the tillers, Microlaena spreads vegetatively via both rhizomes and stolons. The rhizomes and corms make the plant tolerant to heavy grazing. The stolons allow the plant to spread rapidly in favourable seasons. Microlaena flowered quickly after rainfall throughout spring and summer and had two distinct periods of seed rain, in early summer and then again in early autumn. Seed yields were substantial (mean of 800 seeds/m2), though showing considerable variability between plants. Despite substantial seed yields and the high density of Microlaena in the paddock (19% of basal cover), only 5 seedlings per m2 were recorded in 100 m transects in the paddock. 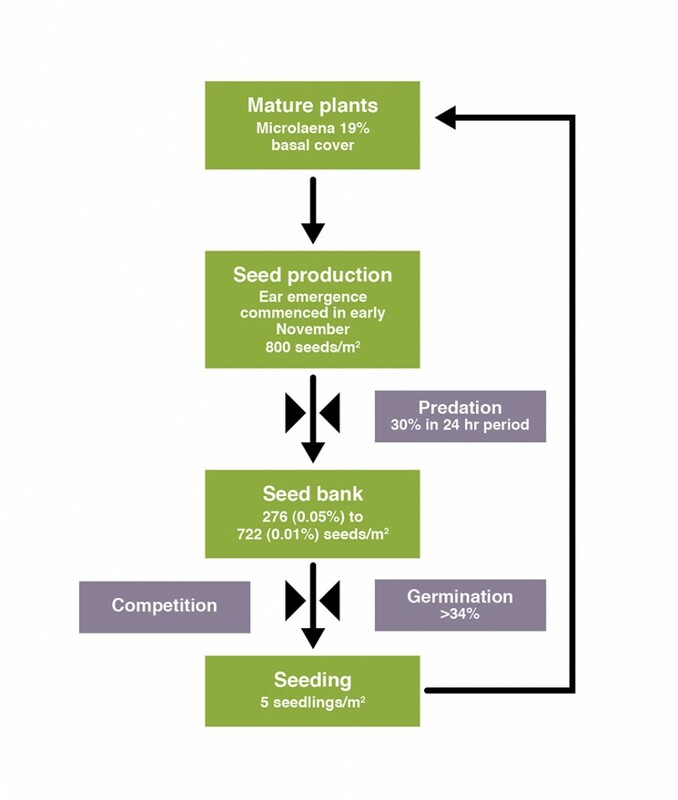 Losses between seed production and establishment included predation (up to 30% of seed removed in a 24 hour period), seed viability (40% of seeds were viable), and competition from annual species (Microlaena formed just 0.05-0.11 of viable seedlings in the seedbank. 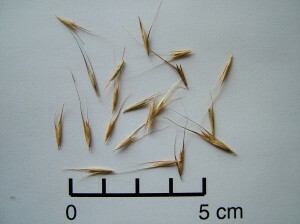 Microlaena stipoides (weeping grass or Microlaena) is found throughout the high rainfall zones from the mountains of Cape York Peninsula through New South Wales and Victoria to Tasmania, as well as the wetter districts of South Australia and the south-west of Western Australia (Figure 1). Survey work on the central and southern Tablelands of NSW found that Microlaena was one of the most common native grass species in grazed pastures, and is also one of the most productive, responding to rainfall year-round and producing quality feed. Microlaena is also responsive to increased soil fertility and moderate-heavy grazing while it is actively growing. Much of the landscape where Microlaena is found is non-arable with shallow soils that are low in pH and phosphorus fertility. Better management of Microlaena within these grazed native pastures will have benefits in terms of livestock production, provision of ground cover and pasture stability. Although the majority of Microlaena use is in native pastures, several cultivars have been developed. A guide to identification of native grass species can be found here. 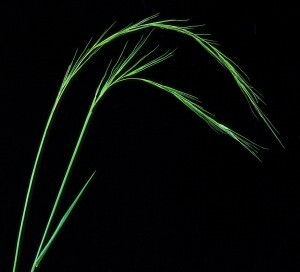 Microlaena is a tufted perennial grass growing to approximately 50cm (Figure 2). 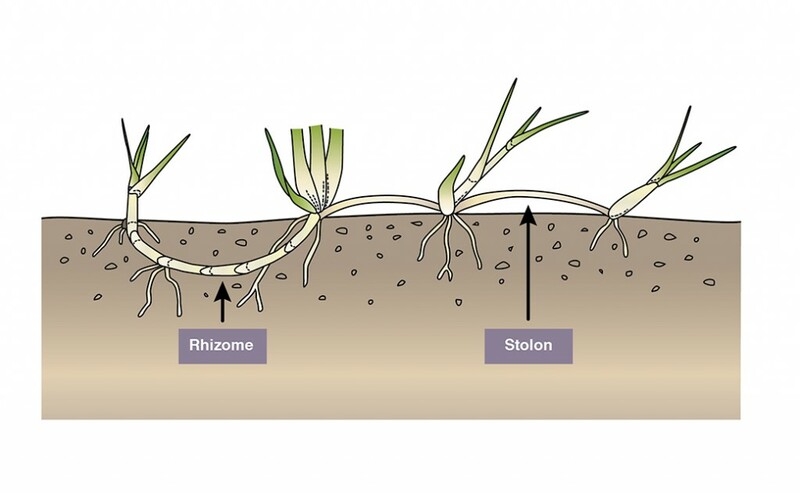 It has a short rhizome (below-ground stem) as well as stolons which connect one plant to another above the ground (Figure 5). 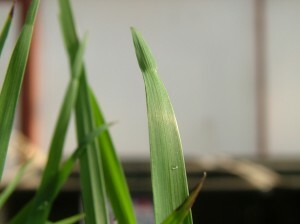 It’s leaves are soft, slightly rough to touch and with a distinctive crimp at the leaf tip (Figure 3). It has slender seed bearing stems to 70 cm with the inﬂorescence portion weeping (Figure 2). Seeds are quite large, up to 15 mm (Figure 4), and can be a problem for wool contamination (Allan and Whalley 2004). The Chiltern Proof Site Microlaena ecology study was undertaken as a PhD study by Meredith Mitchell from Agriculture Victoria Rutherglan to find out more about the growth and reproduction of this important species so that recommendations could be made for improved management. During the period December 2009 – July 2011, fortnightly observations of Microlaena were made noting each phonological stage – vegetative, stem elongation, ear emergence, seed maturity, seed falling and seed fallen. Seed traps were set up around 16 plants and were used to record seed production. Seeds were stimulated to germinate in petri dishes to provide an indication of seed viability. Soil cores were taken from around each of 16 plants and taken to a glass-house where they were stimulated to germinate, providing an indication of the seed bank. A separate experiment was conducted to indicate predation. Finally, a seedling survey in the paddock was conducted along 100 m transects, recording the number of seeds and the number and leaf stage of Microlaena seedlings. Tiller growth of Microlaena arises from corm-like structures which are located approximately 20 mm below the ground surface. In some plants the corms can be found at several different depths. Active buds arise from these corms. The rhizomes and corms make the plant tolerant to heavy grazing. The stolons allow the plant to spread rapidly in good seasons. Ear emergence in Microlaena commenced in early November, and after this initial flowering and seed set, ear emergence continued intermittently for 113 days (Table 1). Microlaena produced seed over a long period, with two distinct periods of high seed rain, in early summer and then again early autumn. The precocious flowering of Microlaena during summer indicates that it could produce inflorescences quickly in response to rainfall. Seed yields were substantial (mean of 800 seeds per m2), though showing considerable variability between plants. Table 1. Seasonal growth stages of Microlaena at Chiltern Proof Site (these periods can vary due to rainfall and temperature). 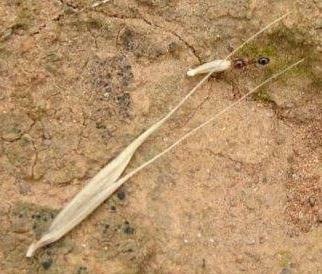 Ant carrying away a Microlaena seed. Despite the substantial seed yields (800 seeds per m2) recorded in the seedling traps around the 16 monitoring plants, and the high density of Microlaena in the paddock (19% of basal cover), only 5 seedlings per m2 were recorded in the 100 m transects in the paddock. Measurements of predation, seed viability and seedling establishment revealed where the losses occur (Figure 7). Predation: In a 24 hour period during peak seed production up to 30% of Microlaena seed was removed from the pasture, primarily by ants. Given this was only over a 24 hour period, we don’t know the full extent of predation, however this would suggest it is substantial. Seed viability: When seeds were isolated and stimulated to germinate in petri dishes, on average 40% of the seeds germinated (range 34-100%). Seeds in the bank: Microlaena formed just 0.05-0.11% of the total viable seedlings which were stimulated to germinate from the soil cores in the lab. The majority of seedlings were from annual species (Table 2). Table 2. Total seedlings per m2 emerged for each group within the seed bank over four wetting and drying cycles. Seedlings in the paddock: The low proportion of Microlaena seedlings compared to annual species resulted in competition for space and resources from other species and the low (5 plants per m2) seedling density observed in the transects. 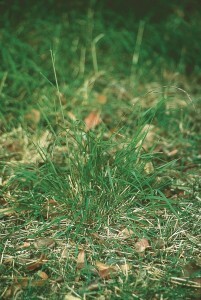 Those seedlings that did establish did so under significant herbage mass, indicating that bare spaces for germination of Microlaena may not be necessary. Figure 7. Flow chart illustrating losses between seed production and germination of Microlaena at the Chiltern Proof Site where adult plant density was high. 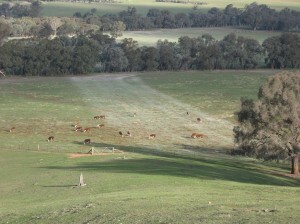 The native pastures at Chiltern, Orange and Holbrook EverGraze Proof Sites were monitored for production and composition under a range of grazing regimes and (at Chiltern) two fertiliser rates from 2008 to 2012. Supporting Sites at Murmungee, Tallangatta Valley and Warrak also provide insights into the response of Microlaena pastures to grazing management and rainfall. All sites had high starting density of Microlaena. The full results relating to the composition responses can be found on the above links, and are summarised below. At all sites, Microlaena basal cover increased rapidly in response to the high summer rainfall in 2010 and 2011. This is thought to be predominately a result of vegetative spread. Wallaby grass also increased at Chiltern (Figure 8) and Orange but the plants were not visible until the second year, indicating that the spread was likely due to seedling establishment. Figure 8. 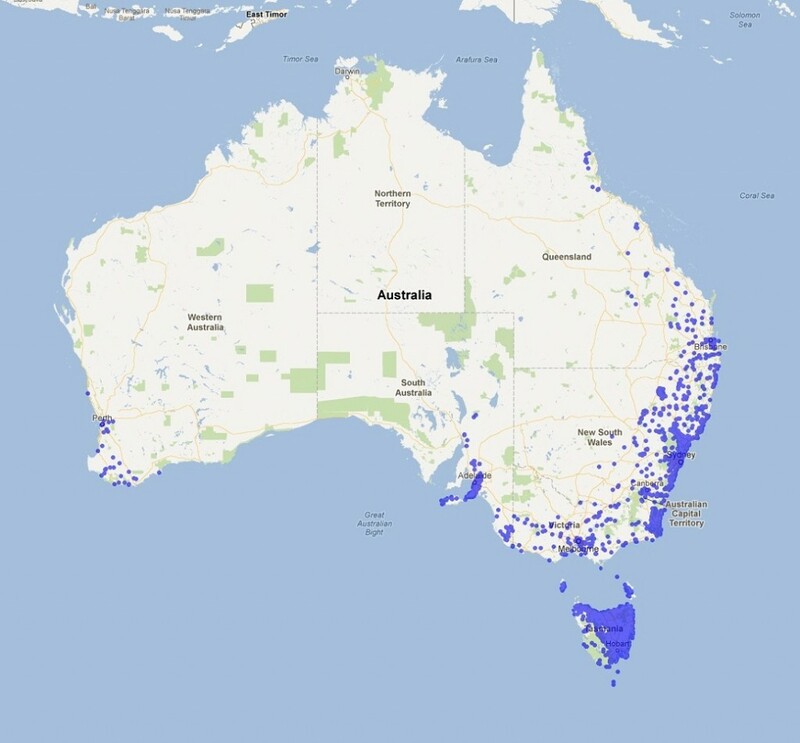 Basal cover (%) for weeping grass and wallaby grass, annually for the period of the experiment, with summer (December, January and February) rainfall (mm). All sites and treatments were managed to EverGraze recommended ground cover (70%) and herbage mass (800 kg/ha) benchmarks. With these benchmarks in place, rotational grazing at Chiltern and Orange had no effect on composition of pastures compared to set stocking during the years of the experiment. Similarly, at Murmungee, deferred grazing (resting the pasture for summer) did not result in increased Microlaena density compared to the grazed control. 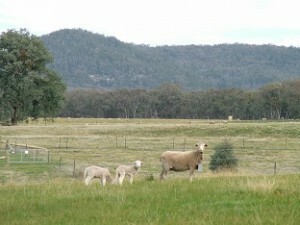 The above findings are supported by work undertaken in the Temperate Pasture Sustainability project (Garden et. al 2000). which concluded that pastures containing a high proportion of Microlaena were stable under a range of grazing regimes. However, research on the Central Tablelands did show that increasing spring grazing pressure and deferment of grazing over the summer months was an effective way of increasing the proportion of Microlaena and decreasing the proportion of silver grass in a pasture (Garden et al. 2000). In all cases, it is noted that long-term change in pasture composition as a result of management is difficult to detect in short-term (three year) studies. Studies on the responsiveness of Microlaena to increased soil fertility have produced variable results. Pot and field trial studies (Garden and Bolger 2001, Hill 2004, Clarke et al. In press) have shown that basal cover and/or dry matter production of Microlaena will increase under increased phosphorus and nitrogen. However, survey results (Robinson et al. 1993) found no such association between the abundance of Microlaena and applied phosphorus fertiliser, and one pot study (Nie et al. 2009) showed that application of phosphorus generally had no significant effect on biomass, tiller density, plant survival or leaf stage of Microlaena. The response of any native pasture to fertiliser will depend on the presence of fertiliser-responsive annual species such as sub-clover, annual ryegrass, barley grass and capeweed. At Chiltern Proof Site where these species were in low proportions, pastures were less responsive to increased soil fertility. The research revealed that while Microlaena is highly adapted to rapid vegetative spread by rhizomes, stolons and corms, seedling establishment is not competitive with annual species. The management of these pastures therefore needs to be based on the maintenance of existing plants since Microlaena recruitment is rare, only occurring in response to seasonal events, especially rainfall during the summer. Results at Chiltern indicated that to ensure the maintenance of Microlaena pastures with high basal cover (above 15% Microlaena), grazing needs to be limited during seasons with below average summer rainfall. 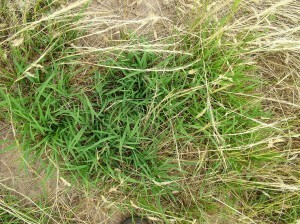 Heavy prolonged grazing, especially in dry summer conditions can lead to a decline in the basal cover of Microlaena. Wet summers are the best opportunity for achieving Microlaena recruitment and vegetative spread. In these situations ideally the pasture should have had hard grazing in the early spring to reduce annual grass biomass and seed set. If the seed set of other species can be reduced, this will increase the competitive advantage of germinating Microlaena seeds. In these seasons, vegetative spread can be achieved without needing to remove stock, but rather limiting grazing pressure (see Chiltern, Orange, Murmungee). Microlaena is not summer dormant so there is no need for production of dormant tiller buds (as in phalaris). In a practical sense this means that Microlaena can be grazed in the spring when there is stem elongation, without impacting on persistence. 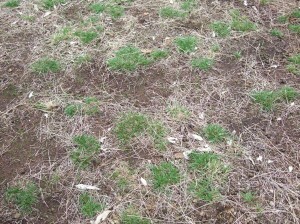 Heavy grazing in spring can also help to lessen the impact of seed in wool. The prostrate growth nature of Microlaena and underground growth point makes it tolerant of heavy grazing. The morphology of Microlaena, with the buried growth point, indicates that this species has the ability to withstand hard grazing. It is recommended that pastures are maintained at above the recommended 800 kg/ha and 70% ground cover benchmarks at all times to manage persistence and soil loss. The highest responses to increased soil fertility will occur in high production zones (see Orange Proof Site) where moisture is less limiting and other productive species such as annual ryegrass and sub clover are present. Microlaena density may increase under higher fertility although competition from annual species needs to be managed with heavy spring grazing. Before applying fertiliser, take a soil test. 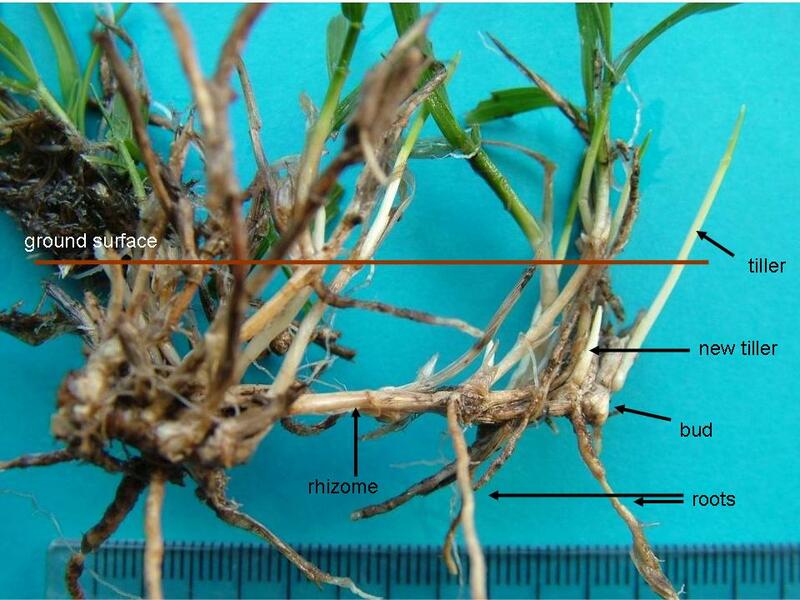 A lime strip applied at Murmungee Supporting Site resulted in an increased proportion of Silver grass (Vulpia sps) than unlimed areas but no response from Microlaena. Given its high acid and aluminium tolerance, lime is unlikely to increase production or basal cover of Microlaena. However, in very acid soils, lime may benefit legume content, although the economics of liming for this purpose is questionable. Again it is best to take a soil test before considering lime. Current recommended management practices (eg. 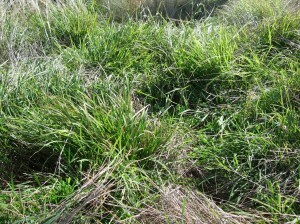 EverGraze Action – Managing native pastures in Victoria) are generalised for Microlaena and wallaby grass. However, the upright growth nature of wallaby grass makes it less able to spread vegetatively, and more reliant on seedling recruitment. 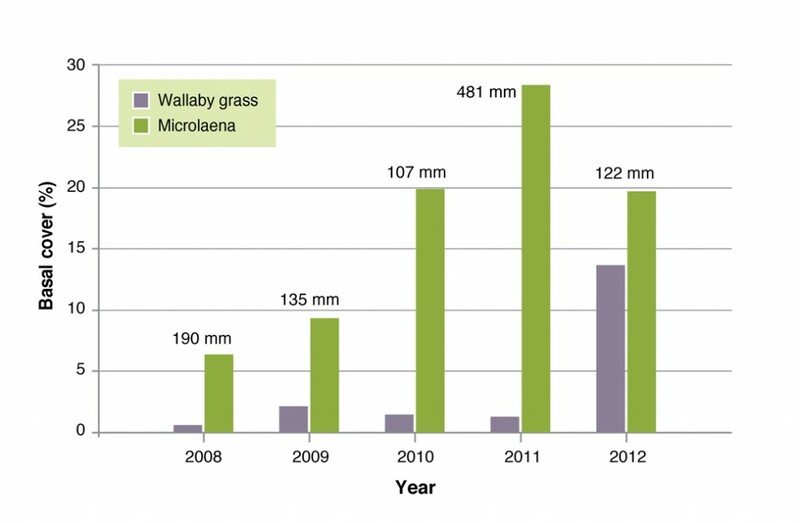 Therefore, increasing the proportion of wallaby grass involves heavy grazing in spring to remove competition from annual grasses, followed by rest to maximise seed production. Excess dry matter needs to be removed in autumn to allow seeds to germinate. EverGraze is a Future Farm Industries CRC research and delivery partnership. The Microlaena Ecology Study was the subject of a PhD conducted by Meredith Mitchell as part of the Chiltern EverGraze Proof Site. Garden, DL, Lodge, GM, Friend, DA, Dowling, PM, Orchard, BA (2000) Effects of grazing management on botanical composition of native grass-based pastures in temperate south-east Australia. Australian Journal of Experimental Agriculture 40, 225-245. Kemp, DR, Dowling, PM, Michalk, DL (1996) Managing the composition of native and naturalised pastures with grazing. New Zealand Journal of Agricultural Research 39, 569-578.